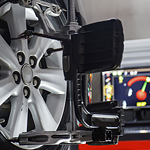 Wheel alignments will also prevent your vehicle from pulling to one side or another. If you feel as though you’re constantly fighting with your steering wheel for control of your vehicle, it’s a good sign that you need an alignment. Call our service center at Volvo Cars of Perrysburg today to schedule a wheel alignment. In no time, we can have you back on the roads of Perrysburg without having to worry about your suspension or steering.